Cannock Dental Care is a well-established NHS dental practice based in Cannock, Staffordshire. We take great pride in delivering high quality dentistry within the NHS. The Practice is located in Cannock Town Centre and is easily accessible from Hednesford, Heath Hayes, Brownhills, Cheslyn Hay and the surrounding areas of Staffordshire. 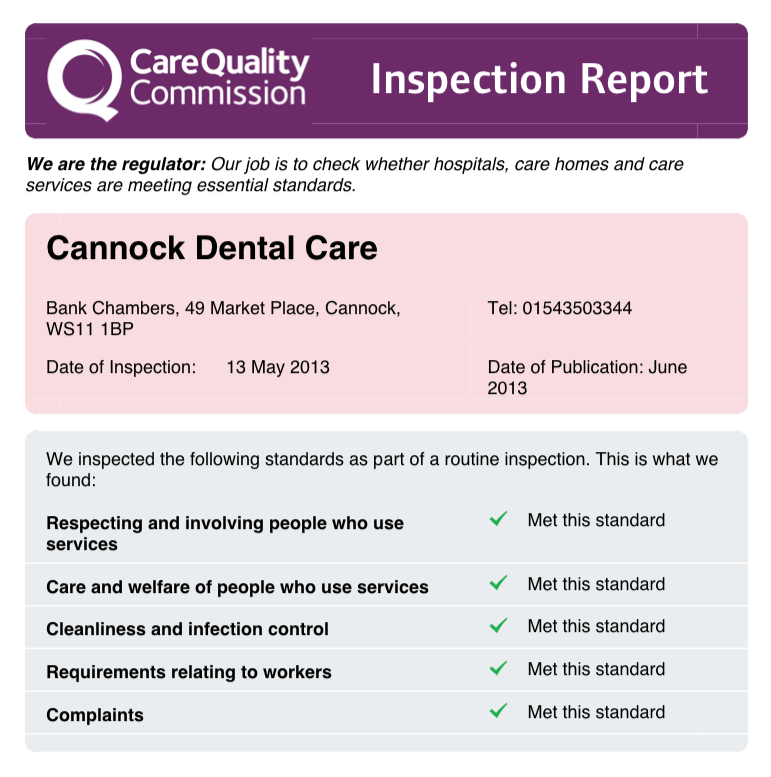 The team at Cannock Dental Care is committed to providing the highest standards of care in a friendly, relaxed environment. Our reputation and on-going success is built on trust and consistently over-delivering on service. We pride ourselves on providing our patients with a bespoke service that is tailored to meet their individual requirements. “I have been totally delighted with the care my family and I receive from this practice. From initial appraisal through to treatment completion”. “I have been visiting this practice for about 10 years now and i would not go elsewhere. I am always very happy with treatment received and the staff are always very friendly and helpful. I would definitely recommend this practice to family and friends”. “My children have always attended this practice and I wouldn’t take them anywhere else. I never have a problem with bringing them, they are happy and relaxed. They are always made to feel comfortable by the dentist”. We genuinely believe that there are many great reasons to choose Cannock Dental Care, we have shared a few of them below, and we look forward to meeting you. Harj graduated from Leeds University, as a Dental Surgeon, in 2000. He has a vast experience of general NHS and private dentistry. Harj has thoroughly enjoyed providing dentistry in Cannock and the surrounding areas since 2012. Natasha graduated from The University of Bristol as a Dental Surgeon in 2011. She soon attained her MFDS qualification from the Royal College of Surgeons. As well as working in general practice, Natasha also works on the Paediatric Department at Birmingham Dental Hospital where she provides specialised treatments. Natasha has a special interest in treating anxious patients and children. Kamal graduated from Mangalore University in 2000, as a Dental Surgeon. He then attended M.G.R. University and attained a Masters Degree in Dentistry in 2005. Kamal has considerable experience in general dentistry and has worked within the NHS since 2007. He enjoys providing all aspects of NHS and private dentistry. My career within the dental profession began once my children were both at school and I started working at a local dental practice in Birmingham. Prior to having my children, I had served as a Police Officer with West Midlands Police. I have been based at Cannock Dental Care since 1987, and have thoroughly enjoyed meeting and assisting the people of Cannock. My role has evolved considerably during this time and I have enjoyed the challenges and opportunities that this has presented over the years. As Practice Manager, I oversee the day-to-day running of the practice. My responsibilities include implementing management systems and ensuring that our high standards are maintained, updated and continuously improved to comply with CQC and GDC regulations. I also strive to ensure that our dedicated team have the support and resources required to provide the highest levels of patient care possible. We carried out this inspection to check on the care and welfare of people who used this service. On the day of the inspection we spoke with the dentist, the practice manager and other dental staff. We also spoke with three people who used the service after the inspection. We were told that people had NHS treatment and also paid for private treatment at this dental practice. We spoke with people who had attended the dental practice for consultations or treatment. Everybody we spoke with told us they were happy with the treatment they received. We found the dental practice to be clean and hygienic. There were systems in place which ensured the practice was cleaned in accordance with dental good practice guidelines. We found that staff members were suitably qualified for their roles. We found the dental practice had a recruitment policy in place. People we spoke with told us the staff were always helpful and appointments were arranged at a convenient time for them. People told us they would be comfortable making a complaint if they needed to. One person told us: “They are absolutely wonderful and staff help all they can”. Another person told us: “The treatment is very thorough. I have no complaints”.